Critics of renewable energy have mocked the Energiewende, claiming that it has led to an increase in coal power and related CO2 emissions in Germany. But Conrad Kunze and Paul Lehmann of the Helmholtz Centre for Environmental Research – UFZ show that this is a myth. German coal generation and CO2 emissions rose not because of but in spite of the Energiewende. They would have been even higher if Germany had not phased out its nuclear power and embarked on its remarkable renewable energy path. “There is no dark side to the Energiewende”. The Energiewende has come in for a good share of mockery in the international media, especially in the Anglo-Saxon and French press. 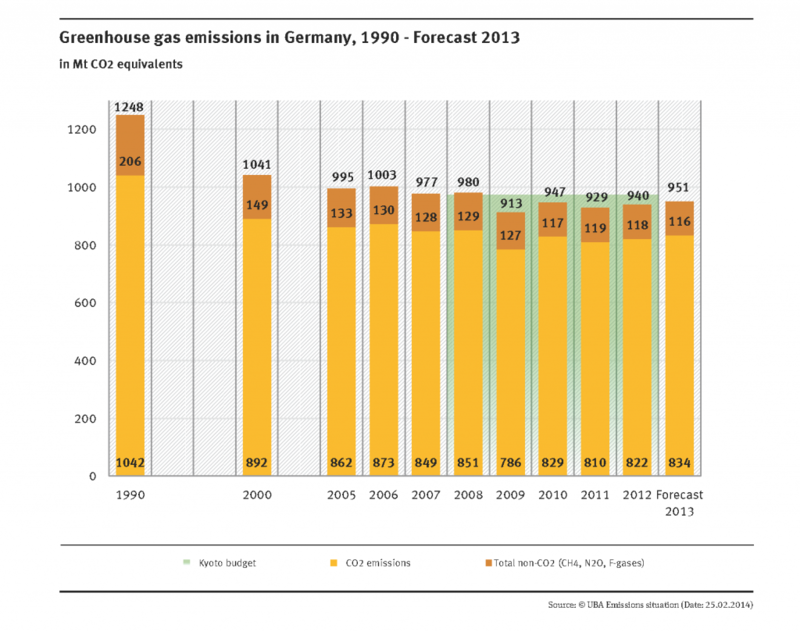 It was widely reported that CO2 emissions in Germany, famous for its anti-nuclear stance and multibillion-euro renewable energy programme, increased in 2013 (and 2012). True enough, in 2013 German emissions – although still well below the levels of 1990 and 2000 – did rise by 1.5% (see Figure 1). And the reason for this was the growth in Germany’s coal-fired power generation (see Figure 2). Is this narrative true? Has the Energiewende really caused a coal binge in Germany? The narrative of Germany’s dirty Energiewende rests on the idea that renewables could not live up to their promise to fill the gap of retiring nuclear reactors. Consequently, that gap needed to be closed by power generation from coal. But if we look at the figures we get quite a different picture. The yellow line in Figure 2 above depicts how the amount of electricity from nuclear declined from 2000 to 2014. Due to the decommissioning of old plants, nuclear power had been declining steadily. When the German government decided on the phase-out, in 2011, some nuclear power stations were shut down immediately and the output went down more quikly. Afterwards, the steady decline continued once more. The green line shows the steady rise of renewable energy in the same period. In 2011, more electric energy was provided from renewable sources than from all nuclear facilities. In 2014, renewables achieved a share of approximately 29% in total electricity generation. So renewables have substituted the falling nuclear production in terms of total annual power generation and are very likely to continue doing so until 2022 when the last nuclear plant will be shut down. Certainly, this observation needs to be interpreted with care. Due to the intermittency of wind and solar energies, power generation from renewables does not always correspond to that of nuclear. Even if renewables can compensate for the reduction in nuclear power generation on an annual basis, there may be shortages throughout the year when the wind is not blowing and the sun is not shining. Such gaps need to be closed by power generation from other sources. Yet, it is not necessarily coal-fired power plants that fill this breach nor nuclear reactors, which are too inflexible. Natural-gas fired power plants are more suitable since they can be ramped up more quickly than coal-fired power plants – and may therefore be better suited to respond to sudden changes in renewables supply. So there is no proof that it was coal power which was expanded when renewable energies were not available. But we know that coal generation did increase in 2012 and 2013. Why was that if not to make up for renewable shortfalls? There is in fact a ready explanation. As renewables and coal increased, and nuclear dropped, overall power generation in Germany increased from 613 to 633 terrawatt-hours (TWh) from 2011 to 2013. Did Germans use that much more energy then? No! In fact, domestic power consumption declined during the same period! 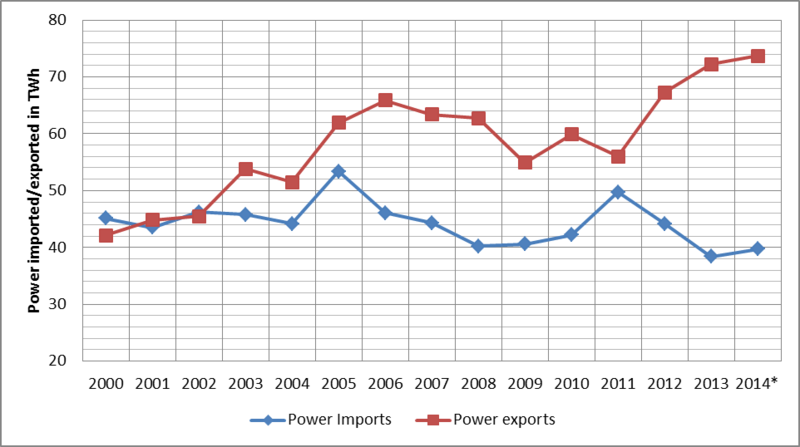 Figure 3, which shows power exports and imports, throws light on the question. The blue line in the graph depicts the amount of imported electricity in TWh. 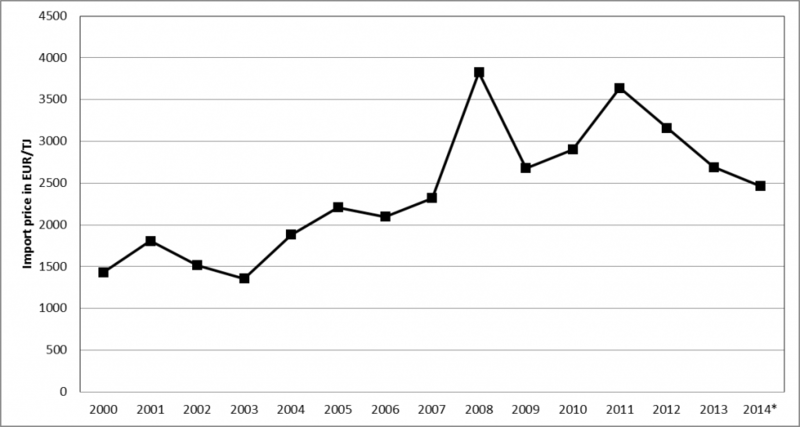 From 2000 to 2007 imports stayed level, despite a brief increase. The red line stands for the amount of exported energy. In 2002 exports started to rise steeply and stayed well above the blue line. In other words, since 2002 Germany has been an electricity exporting country. It also imports, but exports exceed imports. There is a drop in power exports in 2011, the year in which the decision to phase out nuclear was taken. But even with that reduced production capacity in 2011, Germany still exported more than 50 TWh. 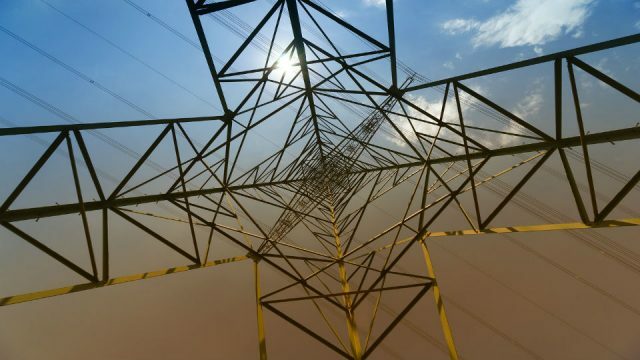 The country has never become an electricity importer again, despite the nuclear phase-out. More importantly, since 2012, exports have been thriving! We may deduce, then, that the German coal binge is related to the increase in overall power generation and exports, not to the Energiewende as such. So why has coal generation been thriving? The actual story has got little to do with the German Energiewende, and a lot with international markets. In fact, the cost of generating power from coal has declined over the past years. World market coal prices have dropped significantly by more than 30% since 2011 (see Figure 4). As the International Energy Agency points out in its recent Medium-Term Coal Market Report, prices have been driven down by a large oversupply of coal, partly as a result of the shale gas boom in the United States, but also thanks to increasing production capacities in Asia. 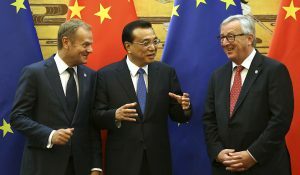 What is more, the prices of CO2 allowances, which need to be held by the operators of fossil-fuelled power plants, have collapsed – from 15-17 Euro per tonne of CO2 in 2011 to 5-7 Euro in 2014. Both effects – the drop in coal and CO2 allowance prices – have made coal an extremely profitable fuel for power generation. Notably, both developments happened in 2011, the year of the nuclear phase-out. Given Germany’s large stock of existing coal-fired power plants, it is no surprise that coal-fired power generation and exports have increased significantly since then. It is thus obvious that the German coal binge has been primarily driven by the developments in international fuel and carbon markets – and hardly, if at all, by Germany’s energy transition. Most likely, it would have occurred in the same way if Germany had not phased out nuclear and promoted renewables. Source: Based on data from BAFA, 2014. Many observers simply don’t believe that it’s possible for a modern industrial nation to phase out both nuclear and fossil power plants, as the Energiewende is aiming to do. In that sense the Energiewende has become a great test case for the possibility of a post-fossil and post-nuclear energy economy. Is it passing that test? If the German Energiewende rests on these two pillars – getting rid of the old nuclear-fossil power plants and setting up new, renewable capacity – the second one is certainly holding up. Renewables rose to an all-time high of 27.7% of electricity production in October 2014 and for the first time beat lignite (26.2%) as the main source for electricity generation. The other pillar, however, is only half-standing. Nuclear plants are gradually shutting down, but what is missing is a mechanism to retire the coal industry. 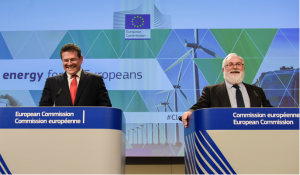 The most effective and efficient means to do so would be the tightening of the European Emissions Trading Scheme (ETS), e.g. by reducing the overall emissions cap or by implementing a price floor. Admittedly, this option may be limited due to political objections from some Member States, notably Poland. Additional measures, such as a politically mandated phase-out of coal were already considered and rejected in the political discourse. Economy Minister Sigmar Gabriel, responsible for the Energiewende, still emphasises the necessity of coal as a bridging technology, to prevent what he has called a “de-industrialisation of Germany”. But the energy industry itself seems to go the other way. In 2014, coal giant RWE was still in financial trouble, the main lignite producer Vattenfall announced its withdrawal from lignite as early as 2015 and Eon has announced its divestment from all coal and nuclear facilities. It is now up to German (and European) policymakers to fully internalise environmental costs in power prices and advance the phasing out of coal. The French-German TV station Arte commented on the expansion of one open cast lignite mine as “the dark side of the Energiewende”. But this is fundamentally wrong: coal generation and related CO2 emissions have risen despite of, not because of, the Energiewende – and presumably would have been even higher without the promotion of renewables. Recent figures support this argument: Germany’s coal-fired power generation and CO2 emissions from power generation have started to decline again in 2014, even if the seasonal effect of the relatively warm winter is excluded (AG Energiebilanzen 2014). Moreover, it is important to emphasize that the Energiewende is not only about climate change mitigation. It also pursues the overall objective of making power generation more sustainable. It is meant to address quite diverse issues next to climate change, such as nuclear hazards, local environmental problems, fuel import dependency and even a democratisation of the energy economy (Kunze/Becker 2014, Gawel et al. 2014). Consequently, an assessment of the Energiewende must not be based on CO2 reduction only, but on all relevant societal benefits. In Germany it took a long time for renewable energy not to be portrayed anymore as a niche activity, unable to provide large-scale power. In international debates this notion still seems commonplace. Mistakenly, as we have tried show. Concluding that the Energiewende has taken the right direction is not to say that it has overcome all major challenges. Important issues still need to be solved, such as safeguarding security of supply with high shares of volatile renewables or mitigating social and ecological conflicts associated with renewables. These are the real challenges that should be spotlighted when discussing the future of the German energy transition, which continues to unfold despite what seems to have been a coal intermezzo. Conrad Kunze is a sociologist and historian at the Department of Urban and Environmental Sociology at the Helmholtz Centre for Environmental Research – UFZ. Paul Lehmann is an environmental economist at the Department of Economics at the Helmholtz Centre for Environmental Research – UFZ. The analysis is clear but I think only provides half the story: Can we identify what source of power generation the German exported power has replaced in neighbouring countries ? If it has replaced lower emitting but, in 2013/4, more expensive Gas fired generation because of economics the regional but not national emissions can be a concern. Is it correct that the emissions associated with the exported power are attributed to the country consuming and not generating the power ? the above quoted statistics, as I understand them, attributes emissions to the place of production, not the place of consumption. Though your argument is a good one, German cheap coal pushes e.g. Dutch gas plants out of the market many times. The same happens in Germany, as Nick wrote. As we have written, supporting gas utilities would be a good short term solution. Only one mention of the obvious solution: a switch from coal to gas. “Natural-gas fired power plants are more suitable since they can be ramped up more quickly than coal-fired power plants – and may therefore be better suited to respond to sudden changes in renewables supply”. It is not the Energiewende or renewables which have caused CO2 to rise: That is a ridiculous assertion. But the carbon price hasn’t worked. And certainly the anti-gas narrative of richer Western green advocates who believe You Tube videos of pollution scares instead of the reality of vast swathes of (poor) Eastern lignite mines hasn’t helped either. The idea that natural gas is the enemy of renewables, a very strong position of the Greens throughout Europe, is the cause of the increase in German emissions. The problem with natural gas is not technical, but political. Since the biggest source would be Russia (some EU countries are gas producers, sure, but not in same scale), it is unfortunately not a good choice from basic security perspective. This is different from US which is both producer and consumer. Alas, this problem is not going away any time soon. But another good question is this: why is Germany so gung-ho in pushing nuclear plants to end-of-line years before their natural cycle? These plants have been paid for, do not emit CO2, so just use them up to expected end-of-line and at least reap the benefits of cheap and steady electricity production. And close brown coal plants instead. At the end of their time renewables have taken over production duties. Win. By 2022 when the last nuclear facility closes, it will have reached or exceeded its life time. The nuclear age in EU is not prolonged within the scheduled life time of reactors but with prolongations that were never part of the security architecture in time of construction. So the statistical risk is rising, old technology is more prone to malfunctioning. As some calculations have shown, nuclear has app. the CO2 footprint of a gas power plant. The uranium needs to be extracted, transported etc. So nuclear may be low, but is not zero carbon. Absolutely not true. 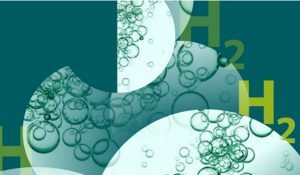 The energetic cost of all phases of the uranium fuel cycle are known, and there is no way that they add up to hundreds of grams CO2/kWh. The calculations you refer to are those of anti nuclear groups with an ideological agenda. Look at any document called ‘environmental product declaration’, like the ones from Vattenfall, and you’ll see that at most it is few tens of grams kWh generated. Jan Willem Storm van Leeuwen und Philip Smith: Nuclear power – the energy balance, 2005, http://www.stormsmith.nl. Marcela Bilek, Clarence Hardy und Manfred Lenzen: Life-Cycle Energy Balance and Greenhouse Gas Emissions of Nuclear Energy in Australia, 2006, http://www.dpmc.gov.au/umpner/docs/commissioned/ISA_report.pdf. The first point, yes, Germany is and will import gas from Russia. The simple fact of existing pipeline networks and production capacities renders any talk of getting independent of Russian imports an illusion. Secondly, even if fracking was adopted full scale, it would be a marginal contribution in Germany and most EU countries. There are no reserves like in north America. The third point, Greens are not opposing gas at all in Germany or EU, they oppose ‘unconventional’ gas, i.e. fracking. Hardly any green advocates oppose conventional, non-fracking gas. I prefer to LOL at the Germans for spending 36 cents per KWH vs the US average of 12 cents. Come on…. you gotta admit that’s funny! I live in Germany and I get electricity from a 100%-renewable-energy supplier. It costs 26 cent per KWh, including tax. It was reduced by 1 cent per KWh this year because the production cost is falling fast. Also, here in Germany there is a big push towards greater efficiency of appliances, like fridges, vacuum cleaners, etc. Consequently, what really matters is how much you spend per month. My monthly electricity bill is 35 Euros, and that includes the use of an electric cooker. The unreported elephant in the room, and inherent weakness of all green energies is the final cost to the consumer (or, in America, our national debt which passes the costs onto our unborn). No nation can afford a fleet of power plants standing by lest the wind stops blowing, or a cloud passes by. Every nation must use what they have. The US is blessed with massive deposits of the best coal on earth. German has Lignite, a very low grade fuel. And the US has oil and gas, whereas Germany must look east and buy it from Russia. Green energy will work but be very expensive and probably erratic. For industries which must have continuous supply, e.g. chemical plants, these characteristics will commercially cripple them. I wish all nations well, particularly mine. Well, the final costs to the unborn generation might not be low for nuclear waste, climate change and post-fracking and post-lignite-mining landscapes. 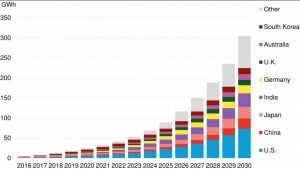 I doubt that the long term costs for renewables exceed those of fossil fuels. My impression has always been that Germany has exported more power precisely in the hours where the wind is blowing and the sun shining and there is a surplus of power production! This is what the poles – importing the surplus power – have been complaining! The positive about The Energiewende that they did something. Pointless discussions usually end up with nothing. 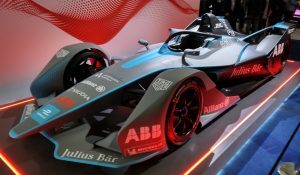 New energy devices-technology is underway and will allow green, affordable, sustainable energy and transportation and offer energy independence to homes and supply enough energy – will start an other discussion is it good or bad to have energy oversupply. It is true that the “dark side of the Energiewende” is not coal. The actual “dark side” of the Energiewende is – due to the disconnection between peak and base load production – the absolute necessity to export the more or less unpredictable excess in renewable peak production. I.e. the Energiewende holds thanks to Germany’s neighborhood, as clearly exemplified by Fig. 2. Would the whole EU to do the same we should have to find another planet to export excess electricity generated when the sun shines and the wind blows. So there is a certain correlation, but it appears that the demand in importing countries is maybe as important as the supply in Germany. The statistic shows, that it is not the exports that alone balance the fluctuations, rather a smaller share of the fluctuations is passed on to exports. You wrote “The country has never become an electricity importer again, despite the nuclear phase-out.” From the graph just below this extract, it is evident that you should have written “a net annual electricity importer”, rather than “an electricity importer”. The whole argument against relying on renewables is that at times Germany needs to import electricity because renewables sometimes don’t produce enough power, so substantial imports will remain necessary from time to time. This argument will of course disappear when low-cost ecological medium-term storage becomes available. The embarkement on renewable energy happened before the nuclear phsa out. If Germany (ceteris paribus) had not phased out nuclear power it would have been necessary to limit power generation from coal, and CO2-emission would have been lower. 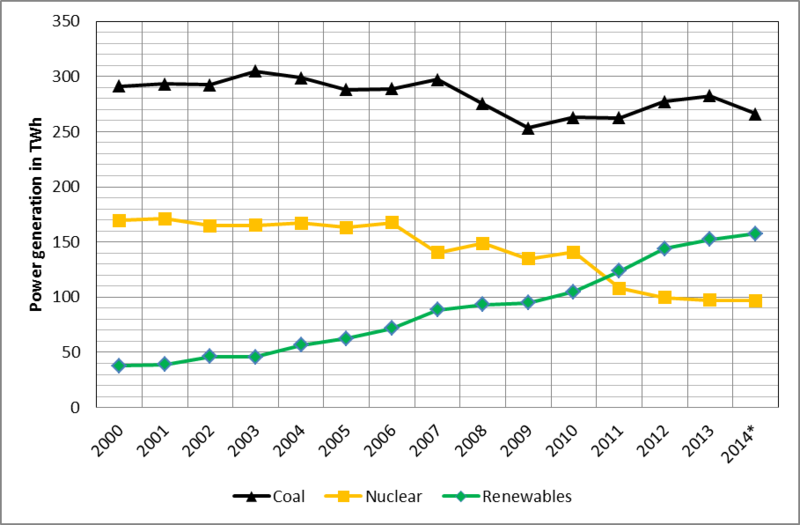 The graphs show quite nicely that nuclear is not replaced by “renewables”, but by natural gas and coal – mainly the former. that’s why Germany’s CO2 production is stable, slightly increasing while other countries are able to reduce CO2 when making use of clean nuclear energy.